In 2017 the St George & Sutherland Medical Research Foundation (SSMRF) received a grant of $4 million from the Federal Government to support core research personnel and the refurbishment of a suite of laboratories at St George Hospital. In addition, in October 2017, SSMRF awarded six inaugural MRC Grants. Improved understanding of the microbiome is the most exciting development in medicine over the past decade and it impacts on all aspects of health and disease. Though physically located at St George Hospital, the MRC will act as a hub of internationally competitive research rallying together multidisciplinary research groups at St George and Sutherland hospitals. “The region has one of the biggest health and medical precincts in Australia, combining public and private hospitals and suites and services – this project will add major health, economic and employment value.” “The MRC will act as a magnet attracting gifted researchers from across the world and will offer unrivalled opportunities for training and inspiring the next generation of researchers in medicine and allied health specialties.” Commented Emad El-Omar, Professor of Medicine UNSW and MRC Director. The human gut is a unique niche that is home to trillions of microbes known as microbiota. Almost every system in the body is influenced by the microbiota and our health and wellbeing are dependent on having a diverse, balanced and healthy microbiota. St George and Sutherland hospitals serve a large and diverse population that has significant healthcare demands. Our population suffers particularly from modern western diseases such as obesity and its metabolic complications including diabetes, cardiovascular and cerebrovascular disease. There is also a substantial cancer, mental health and inflammatory disease burden. All these diseases have been shown to be directly linked to abnormalities in the microbiota. The MRC grant recipients are currently studying the effect of the microbiome in pregnancy, bowel cancer, head and neck cancer, clotting and thrombosis, systemic lupus erythematosus (SLE) and inflammatory bowel diseases (IBD). 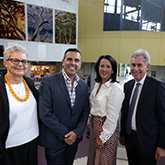 “The MRC will be a flagship for medical research at St George and Sutherland Hospitals” “I am looking to the community and local businesses to support SSMRF and ensure we create a world-class research centre in our local hospital.” commented CEO Jacquie Stratford. To make a tax-deductible donation in support of the Microbiome Research Centre please donate online here.